Go Bike will be at the launch of CamGlen Bike Town on Saturday 19th July between 11am and 4pm. Bike Town is encouraging everyone to cycle to Cambuslang Park and add their bike to the Interactive Bike Tower sculpture which is 5m high and holds 40 bikes. • Free cycle bag for the first 100 who arrive on a bike and hang their bikes on the sculpture. • Plus free refreshments for all who arrive by bike. • Lots of prizes, freebies and giveaways. • Free Bling your Bike with Eilidh’s Box Bike. • Entertainment and sounds provided by CamGlen Radio. • GoBike will be there plus other stalls with cycling and community related information. The sculpture will stay in place until 3pm on Sunday the 20th July. Do you cycle in Glasgow city centre? Find out about the council’s plans for cycle routes and have your say. Downstairs function room , Admiral Bar, 72A Waterloo St. Doors open 19:00pm. Go Bike has arranged this meeting to provide feedback to Glasgow City Council (GCC) on their plans for cycle paths in the city centre. Feedback on routes, an opportunity for all participants to mark their regular routes, desired routes, known obstructions and locations of concern on large-scale city maps. 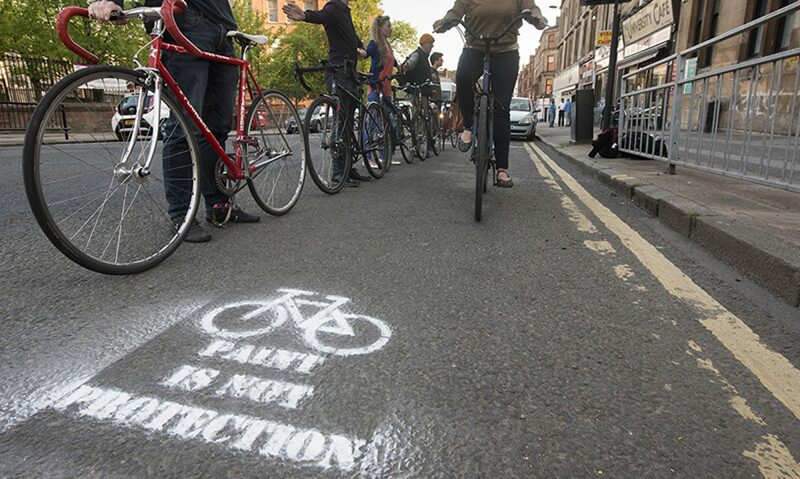 Please come and help to improve cycling in Glasgow!